Udupi, June 19, 2017: A driver of the Maruthi Ecco loses control after the car tyre bursts rams into a car and 2 two-wheelers. 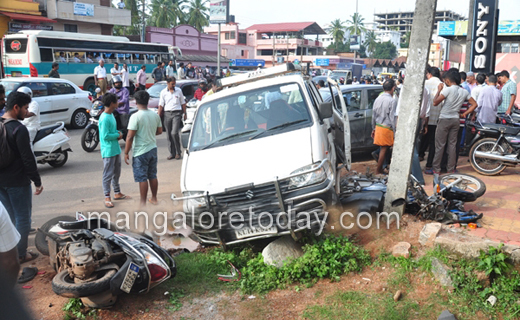 The accident took place at Kadiyali in Udupi on June 19, Monday. The driver of Ecco is identified as Umar. He has escaped with minor injuries. It is learnt that the Umar was on his way to Udupi from Manipal as he reached Kadiyali , the car goes out of control as the tyre bursts. The imapct was such that Ecco rammed into a car, later into a parked scooter and futher into another bike and halted. As the bike was parked nearby the elecric pole the car avoided being hit to the pole. Luckily the occupants of the car too escape with minor injuries. The traffic in the region was snarled for sometime due to the accident. A case has been registered in Udupi police station.